Please empty out all food and liquids! Please remove tape from cardboard boxes! 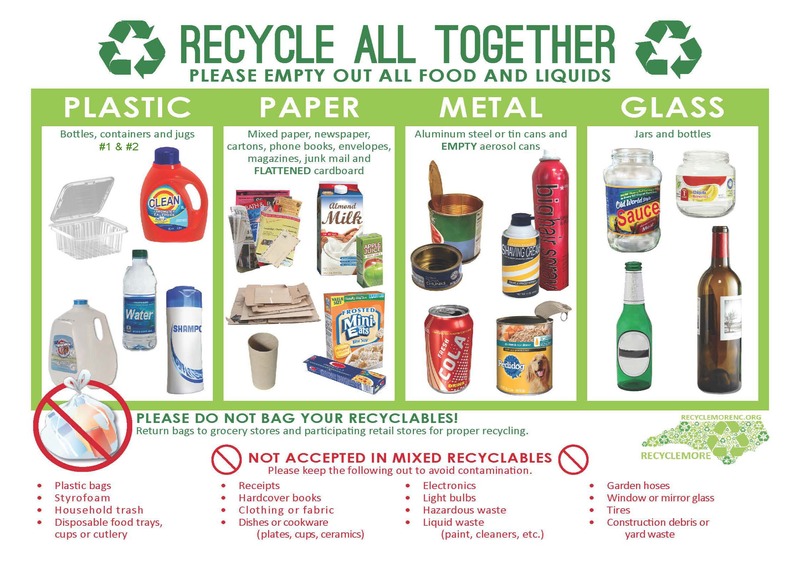 Please do not bag your recyclables! Return bags to grocery stores and participating retail stores for proper recycling. Download a brochure with this information. Waste Industries offers curbside recycling collection to all residents of Brunswick County. There is an annual fee for the service, which includes the cost of the 96-gallon, blue roll-out cart and bi-weekly recycling collection. For rates or to sign up, contact Waste Industries at 910-253-4177. The landfill is open from 8 a.m. – 4 p.m., Monday – Saturday. The convenience centers are open from 8 a.m. – 6 p.m., Monday, Wednesday, Friday and Saturday. Park hours are based on Daylight Savings Time, so in the summer months the Parks are open 8am until 10pm, in the winter months, 8am until 9pm.